ANEWKODI USB 3.0 AC1200 dual band USB wireless adapter is the latest product developed by our company. This product has been greatly improved in function and quality. Compared to the 600M adapter that is common see on amazon. First, we changed the USB 2.0 to USB 3.0. This design allows more customers enjoy this latest product. Second, AC1200 has a 5dBi antenna. This design will enable the product to better receive signals from the router even if there is a wall in the room. AC1200 support dual band, the maximum speed can be up to 867Mbps when you connect to 5G. This product is the best choice for web surfing, online chatting, on-line streaming of HD video, gaming, music, photo. This product is made from stronger materials, say goodbye to fragile products. ANEWKODI has several years of sales experience at amazon. Thousands of customers have chosen to trust us. Choose ANEWKODI AC1200, it will definitely bring you a different experience. 1. Insert mini CD or download driver from online driver link to install the program. 2. Insert the Wi-Fi dongle to connect any USB port. 3. Open the "REALTEK USB Wireless LAN Utility", click "available networks", select the network signal and connect. 2. Our company has a professional after-sales service team. If you have any questions or problems when using, please contact us immediately for a better solution. 3. Please plug the Wi-Fi dongle into the usb ports behind the computer host if you have a desktop. This way will let the Wi-Fi dongle get enough power. 4. Please turn off the built-in Wi-Fi when you use this product on the laptop. ( If your laptop has the built-in Wi-Fi ). 1* 18-Months free warranty card. ★ Buy a reliable product. We know that many Wi-Fi dongles has quality problems. Like it will stop working after few days. Since we know your pain. Please let our product to help you. ANEWKODI uses the latest chip-RTL8812BU. At the same time advanced processing technology makes the product more durable. Once-off payment, Happy every moment. ★ It will let you experience unimaginable speed. 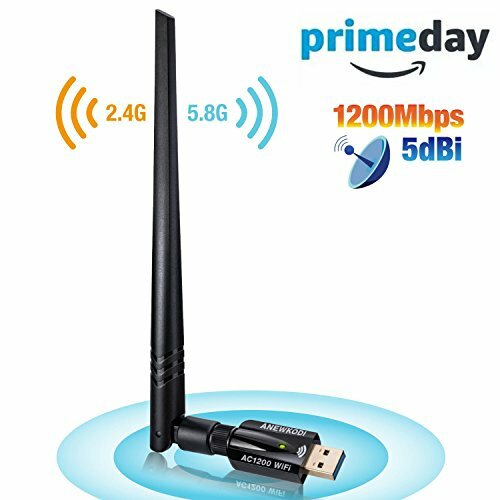 This Wi-Fi dongle supports dual band (2.4G and 5.8G), using the latest & most powerful 802.11ac Wi-Fi technology, 3 times faster than wireless N speeds. Maximum speed up to 5GHz (867Mbps) or 2.4GHz (300Mbps). It is the ideal for gaming online and seamless HD video streaming. ★ Say goodbye to spotty Wi-Fi dead zones! You don't have to face with slow internet speeds at home, or even if you're outside the house. The 5dBi antenna provides strong penetrating ability and stability. It will stay good connection when signals are very weak. Better Wi-Fi performance than others 2dBi/3dBi Wi-Fi adapters. AC1200 Wi-Fi adapter support all WLAN routers: WPA/WPA2/WEP. You won't have unexpected dropped calls or loss of signal quality period. ★ Easy to use. You can also use this product even if you are not proficient in computers. It supports USB 3.0 and USB 2.0 No drivers required for Windows 10! Just plug and play! Compatible with windows 10/8/8.1/7/Vista/2000, Mac OS 10.9 and higher. ★ 18 MONTH WORRY-FREE WARRANTY. Our company attaches great importance to customer service. If you have any problems when using, just feel free to contact us. We will offer you our best service in 24 hours and solve the problem immediately.